Home > Air Tool Accessories > Retracting Air Hose Reels > Retracting Air Hose Reel-25 ft. x 3/8 in. 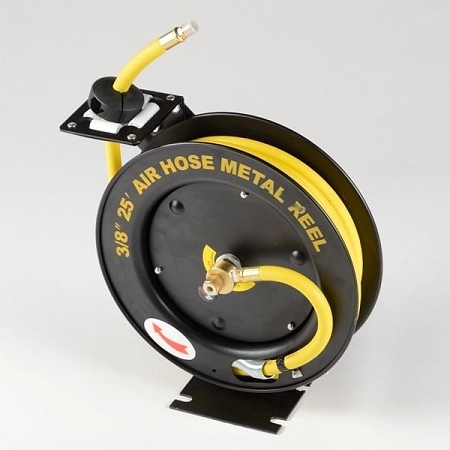 Retracting Air Hose Reel-25 ft. x 3/8 in. Manufactured from industrial grade corrosion resistant steel. This unit can be mounted to the floor, wall or ceiling in your shop. Quality unit at a great price. Includes 25 ft. of 3/8 in. rubber air hose. The hose is rated at 300 psi working pressure. The hose locks in place at the desired length. Machined brass fittings. Full flow solid brass swivel joint. The multi-position release ratchet and spring are fully enclosed and lubricated for years of service. Four direction non snag rollers guide the air hose and reduce hose wear. 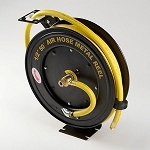 Retracting Air Hose Reel-50 ft. x 3/8 in. 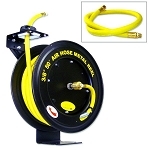 Retracting Air Hose Reel-50 ft. x 1/2 in. 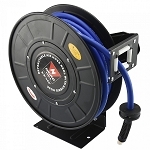 Retracting Air Hose Reel-75 ft. x 3/8 in. 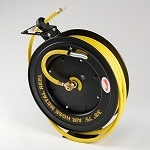 Retracting Hybrid Air Hose Reel-50 ft. x 3/8 in.